Zoom Player is a Powerful, Flexible and Highly Customizable Media Player and Media Center software for the Windows PC platform. Using our Smart Play technology, more media formats play with less hassle, improved stability and greater performance. Zoom Player's fullscreen navigation interface is based on a simple 5-Key system (up/down/left/right/select). The 5-key system gives you easy access and navigation to such interfaces as Media Library, File Browsing, Playlist, Color Control, Audio Equalizer, Bookmarks, Play History and many more. The system's simplicity makes it ideal for users with no previous computer experience. With Zoom Player, you can instantly Convert any PC into a Home Entertainment Center or Home Theater PC (HTPC/Media Center) with no requirement for specialized hardware or operating system (Zoom Player runs on every version of Windows). Utilizing Zoom Player's modular design and flexibility, you can easily design a safe viewing environment, limiting or extending functionality, making it ideal for both children and to the consummate professional. 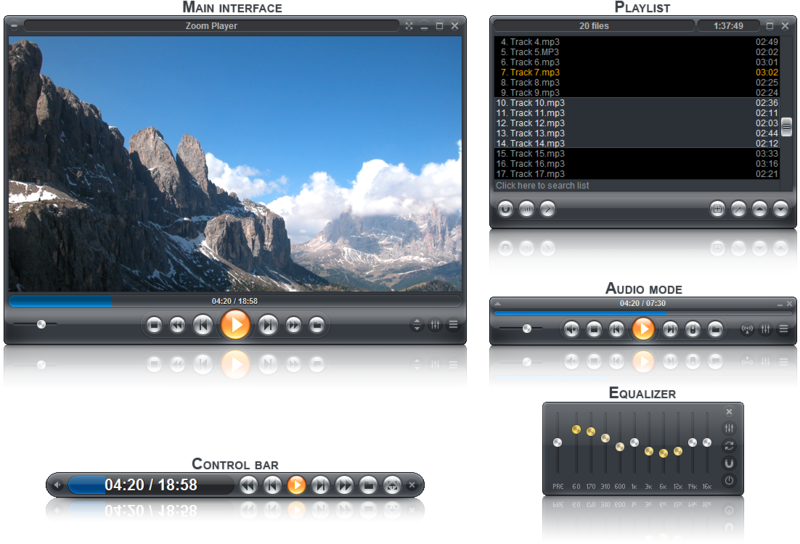 Zoom Player is fully scalable, supporting all the latest media formats and interfaces. New features are incorporated on an ongoing basis with release schedules and feature integration clearly announced on our support Forum and Twitter account.